Officials with the California Department of Water Resources were apparently thinking something similar. They got in touch with researchers at Utah State University as part of the process to figure out just how to approach the job of rebuilding the 3,000-foot-long concrete chute. The department hired the university’s Water Research Laboratory to create a scale model of the spillway to help assess its condition after it breached and broke apart and to test concepts for its reconstruction. “When we were contacted back in February, DWR had no idea what was feasible in this construction season,” Michael Johnson, an associate professor of hydraulic engineering at Utah State, said in an interview Thursday. “They realized they may have to run this thing again this year, before it’s finished. So part of our work was evaluating conditions for this coming season,” Johnson said. To do that, Johnson and a team of fellow researchers, engineers and technicians built a 1:50 scale model — essentially, a replica that’s 1/50th the original’s size — of the wrecked spillway. To create the very realistic 3-D model, Johnson says, the team used lidar (light detection and ranging) data from the Department of Water Resources. 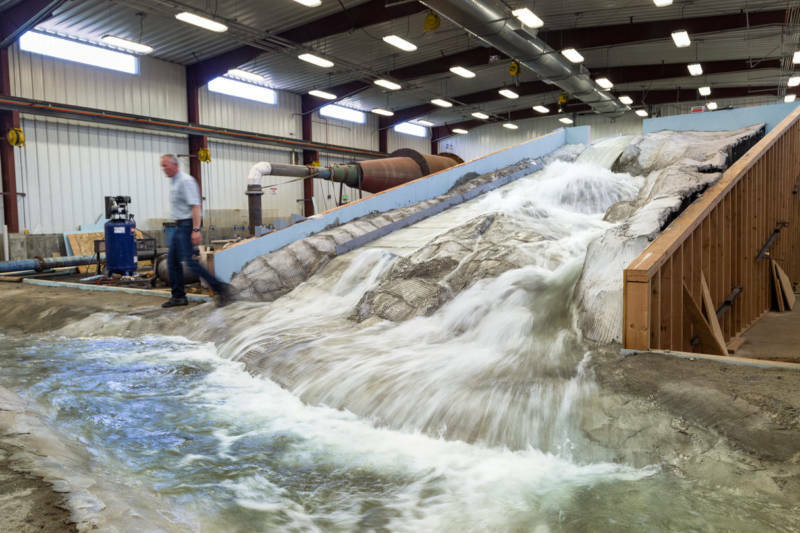 The lab has since created a version of the model that depicts an intact spillway. The purpose of Spillway Model 2.0 is to test design features under consideration for the rebuilt structure. Among those features being examined on the model: aerators for the surface of the concrete chute that are designed to prevent or dampen some of the destructive effects of water that prototypes suggest can move down the steeper sections of the spillway at 130 feet per second — nearly 90 mph. The Department of Water Resources and its contractor on the project, Kiewit Infrastructure West, have outlined a spillway rebuilding plan stretching over two construction seasons. In the first season, which began in late May and is slated to last through next November — later if weather and reservoir conditions allow — crews will demolish and rebuild most of the lower section of the damaged concrete chute. At the same time, workers will undertake a second massive project to reinforce that unpaved hillside designated as the dam’s emergency spillway. A 1,730-foot concrete weir at the top of the slope and adjacent to the main spillway is designed to allow uncontrolled flows down the slope from Lake Oroville to the Feather River. The slope eroded rapidly when water flowed over the emergency weir in February, threatening to undermine the weir and unleash a catastrophic flood. To try to stem erosion in the event the emergency spillway is pressed into service again, DWR’s plan calls for building a huge “cutoff” wall on the slope beneath the weir. The water agency has said that work should be finished by November. In the second construction season, contractors will rebuild the upper portion of the main spillway chute and build a massive concrete “splash pad” below the emergency weir — another step intended to prevent erosion. Utah State’s project is not the first time hydraulic engineers have created a model to test the design of the Oroville Dam Spillway. If you’ve dipped your toe into the history of the dam since February’s crisis — wondering, for instance, exactly what the engineers who designed the complex had in mind when they decided to create an emergency overflow down a bare hillside — then you may well have stumbled onto a document labeled HYD-510. The U.S. Bureau of Reclamation produced the 189-page paper in 1965 to summarize the results of spillway design testing it had performed at the request of the California Department of Water Resources, which had puzzled over how to configure the structure. Just as a reminder, major dams need spillways to regulate the levels of the reservoirs behind them. They allow excess water to flow at a controlled rate through or around dams and prevent reservoirs from flowing over the top of the dam itself. In the case of an earthen embankment dam like Oroville, an overtopping event could erode the dam, undermine its structural integrity and lead to collapse — a calamity. The design of the spillway at Oroville presented some special challenges, though not necessarily unique ones, because of the sheer size of the dam (you’ve read by this time that it’s the nation’s tallest) and the reservoir it would create as it held back the waters of the Feather River watershed (the reservoir, Lake Oroville, is the second-largest in the state; when it’s full, it holds enough water to supply about 7 million California households for a year). The report describes the process of testing conducted at a Bureau of Reclamation lab in Denver, and it’s full of details that might never occur to the casual spillway-watcher. For instance, how much water the main spillway and the nearby emergency spillway were designed to handle, and under what conditions. One of the big areas of inquiry was how different configurations of the the channel outside the massive spillway gates would affect the speed and turbulence of the flow heading into the spillway’s concrete chute. More than 50 years and one major spillway crisis later, Utah State’s researchers are revisiting many of the same problems. Starbucks incorporated metering in its stores, along with weather-based lighting and HVAC, reducing utility costs by 6%. Since its inception, the Department of Energy’s Better Buildings Challenge has helped businesses and organizations hold themselves accountable with the goal of making buildings 20% more energy efficient. By expecting partners to measure and share energy usage data, many partners are well on their way to this goal and 18 have achieved their portfolio-wide goal. In the 2017 Better Buildings Progress Report, the program shares its partners’ successes – namely that they have produced savings of 240 trillion BTUs and $1.9 billion in cumulative energy and cost. One company highlighted in the report, Starbucks, saw significant improvements through power metering. Metering systems allowed Starbucks to measure the performance of equipment and customer comfort in its stores. It also used local weather conditions to set in-store temperatures and lighting, reducing utility costs by an average of 6%. The report also commended the Wendy’s Company for its benchmarking efforts, as it began actively recruiting franchisees to join the Better Buildings Challenge. For those that joined, Wendy’s offered technical and benchmarking support through a third party to support franchisees with energy efficiency. One such franchisee now features all LED lighting and efficient HVAC equipment, which has yielded significant energy savings. Holding an Energy Management Information Systems workshop with over 30 program stakeholders. Hosted by Lawrence Berkeley National Laboratory, participants learned more about submetering, occupant engagement and M&V 2.0. The Berkeley Lab’s Center of Expertise for Energy Efficiency in Data Centers published metering guidance that helps data center operators identify what they need to make better energy efficiency decisions for their facilities. To read the report, visit betterbuildingsinitiative.energy.gov. The ultimate goal in a homeowners association is for everyone to be respectful and live together peacefully. However, it’s hard to accomplish both of these goals when you have members breaking the rules – especially if it’s a board member. It’s the responsibility of an HOA board to protect, maintain, and enhance the Association through its leadership, so what happens when one of its own is breaking the rules? Depending on the situation, it may be a good idea to seek legal counsel early on in the process because you are not an attorney. Even if you think you know what you’re doing and are trying to save money, you are still putting the Association at risk of being sued. For example, if you call the board member out in a meeting they have grounds to sue. Instead, request an executive session to discuss the situation privately. Who Can Call a Board Meeting and Can an Officer Refuse? Any board member can ask for a special session. Anyone who holds an office on the board (such as president) cannot refuse to attend. The board also cannot vote someone off the board, but it can strip them from holding an office position – they would just be demoted to regular board member. An officer on the Board cannot refuse a board meeting nor do they have implied authority to make independent decisions. These responsibilities are listed in the Bylaws. On the flipside, members can’t call meetings, but they can request to be on the agenda at a board meeting. Members can start a recall petition and only the membership can recall a board member – otherwise it would be chaos and your board members would continually turn over just because someone didn’t like them. All of this applies unless your Association has developed rules of conduct that say otherwise and detail out specific actions to take, and all board members have signed it. As an HOA board member, you open yourself to living a more public life within the homeowners association. It’s your responsibility to conduct yourself accordingly because, let’s face it, people talk too much and some will find any excuse to find fault with people. If your board is finding that homeowners and board members are consistently breaking rules, it may be time to revisit specific rules to see if they’re unreasonable and need to be changed. This is just one way board members can make a reasonable business decision. The Board may also want to consider hiring an HOA manager to both hold them accountable and help them navigate the governance of the Association. Without an HOA manager, some board members start to see themselves as “special” and take advantage of doing wrong for their gain. Homeowners associations act as both landlords and mini-governments to their members, which means homeowners have rights that HOAs should both acknowledge and protect. This requires mutual respect from both parties: homeowners must respect the HOA’s authority while the association must respect a homeowner’s individual freedoms. Yet the challenge is overcoming the classic one-sided perspective of seeing any conflict as only a board member or only a homeowner problem. Honesty, transparency, and respect are the foundations of community in every association. Some boards of directors, when they become frustrated by an individual owner, don’t want to allow the right to inspect the books. They don’t want to be bothered. On the other hand, many homeowners grow suspicious when their board withholds information, and may even pursue legal action. So, what’s right and what’s unfair? Is there any legal protection for homeowners? The answer is a resounding yes. In this article, we’ll discuss what homeowners can expect when living in an HOA, whether it be a condominium complex or planned unit development, as well as provide a list of homeowner rights specifically sanctioned by the Davis-Stirling Act. In California, homeowners’ rights are established by the governing documents of the HOA, the Corporations Code (where it establishes guidelines for associations to govern their members), and the Davis-Stirling Act. Before a homeowner can question if they’re being treated unfairly by their HOA’s board, they must first learn their legally protected rights as part of the membership. Upon joining an HOA’s membership, homeowners should expect a certain quality of treatment from their association. These expectations are based on rights established in the law, or on basic standards of decency and respect. Homeowners deserve a response to an inquiry, unless of course the inquiry is ludicrous or threatening, or the demand(s) are intended to harass. Homeowners should expect that HOA financial and other records will be kept in a routine manner for reasonably easy access. Homeowners should expect disclosure procedures which ensure easy access to most documents within a reasonable time and without unreasonable restrictions. Homeowners should get a timely notice and a fair opportunity to be heard if the HOA intends to take disciplinary action against them. Homeowners deserve consistent treatment in enforcement of rules and regulations. Homeowners deserve a reasonable opportunity to vote in important elections or to appoint another to vote on their behalf. Homeowners deserve to be informed of their voting eligibility if they do not qualify to vote per the governing documents before a vote is held. Homeowners should try to educate themselves as much as possible on HOA rules and regulations to ensure they are being treated fairly and justly by their association. Useful information can be gained from attending HOA educational seminars, sharing information amongst fellow members, reading publications and journals, and researching on the web. If you don’t know where to start, try asking your HOA’s manager, or reading this article on the basics of HOA operation. By knowing what is expected of the HOA and its governing board, you can better understand where you stand in the scheme of things, and most importantly, what rights you have as a member. Inherent in the condominium concept is the principle that to promote the health, happiness, and peace of mind of the majority of the unit homeowners since they are living in such close proximity and using facilities in common, each unit owner must give up a certain degree of freedom of choice which he [or she] might otherwise enjoy in separate, privately owned property. Condominium unit homeowners comprise a little democratic sub-society of necessity more restrictive as it pertains to the use of condominium property than may be existent outside the condominium organization. Therefore, condominium owners are expected to relinquish a bit of their freedom due to the nature of their living situation. Homeowners are entitled to 4 days’ notice and an agenda for all open association meetings. If an executive session is held at a separate time, homeowners must be informed at least two days before the meeting. No owner notice is required for emergency meetings (Civil Code Section 4920). Homeowners may attend and address the board at open meetings at the time and in the manner established by the board (Civil Code Section 4925). There are penalties in the statute including $500 fines for failure of the board to comply. For the complete list of association records, see Civil Code Section 5200. Associations must allow posting or displaying of noncommercial signs, posters, flags, or banners on or in an owner’s separate interest. However, rules and limitations can be made for the protection of public health or safety or if the posting or display would violate a local, state, or federal law. (Civil Code Section 4710) The board can also restrict signs that constitute a nuisance or display obscenity, and can control the signs made for HOA elections (with reasonable restrictions). Keep in mind that this list of rights and entitlements, while a good reference tool, is not all-inclusive. Homeowners can do a lot of other things according to HOA policies, but boards generally have ultimate control over architectural approvals, parking assignments, and any exterior additions or modifications, use of the common areas, and conduct (accomplished commonly through rule setting). Homeowners who assertively pursue their rights through reasonable and proper channels can change their HOA, while boards who wrongly or purposefully deny rights of homeowners who are behaving reasonably will only hinder the HOA’s purpose. And when both parties work together towards one common goal, it’s amazing the community they can build. It is important to create good association operating rules and to make sure the rule topics required by statute are also covered, but all that is wasted if the association fails to follow the required rule amendment process. Because rules are amended only by the board, the Civil Code requires special procedures to alert members in advance when boards consider changing or creating rules. 1. First meeting: The board must give members at least 30 days advance written notice, with a copy of the verbatim proposed change and a statement as the purpose and effect of the change. 2. At the second board meeting, considering the rule change, the board must receive member comments (if any). 3. If the rule change is adopted, notice must be given to members within 15 days after the meeting. 4. If the change is controversial, 5 percent or more of the membership may, within 30 days of notification of a rule change, demand a membership meeting to vote upon its reversal. If a majority of a quorum vote to overturn it, the rule change may not be reinstated by the board for one year. The law allows for emergency rules, if immediate action is necessary to avoid imminent threat to health, safety or to substantial economic loss. Boards may pass emergency rules for up to 120 days but they cannot be renewed. 1. Discuss the rule. If the rule change is too complicated to draft during the board meeting, then delegate someone (the attorney perhaps?) to draft language to be considered at the next meeting for publication. It is better to have good rules adopted slowly than poor rules quickly approved. 2. Once the rule change motion is introduced and seconded, suspend board deliberations and reopen members’ open forum on the rule change. Chances are, there will not be much comment, unless the rule change is controversial. 3. Listen to the members. The open forum aspect of the process is very important. Listen. If significant opposition to the rule arises, more consideration should be given. Can the proposed change perhaps be improved? Is the board disturbing a hornet nest, so that an overturn vote is all but certain? Such a rule change may not be in the best interests of neighborhood relations, even though it may have originally seemed like a good idea. 4. Must the amendment be passed immediately? Perhaps after further study/discussion/modification, it can be republished to members for a later board vote. 5. If the change is adopted, send notice to the membership quickly. Don’t wait to send it with the draft meeting minutes – the secretary has 30 days for the minutes, while this notice must go out within 15. Perfection is not required. Per Civil 4350(d), as long as the board acts in good faith and in substantial compliance with the process, the rule should be valid, even if some minor noncompliance with the process occurs. The law, while potentially frustrating, protects associations by forcing their boards to slow down before changing rules, thereby giving members an important voice in this process. The hoped-for results are better and less divisive rules and more harmonious communities. Many high-rises want to implement “green” living practices and create eco-friendly communities. However, many of them don’t know how to get started. Before embarking on any sustainability program, consider forming a committee of interested residents to take ownership of the initiative. Conduct a poll to find out what kinds of programs residents are most interested in having so that your efforts get the maximum return. And, ask experts who can draw from best practices across many buildings and cities. Read on to learn about programs and services you can put in place in your community at little to no cost! Energy and water conservation are the biggest ways to make your high-rise building greener and more sustainable. Lighting in common areas and heating and cooling systems all use substantial energy. By updating them to newer, more efficient systems or adding control systems your association can save enough on energy to pay for the upgrades over time, while saving nonrenewable resources,” according to Chris Normandeau, director of FS Energy. FS Energy helps clients significantly enhance their building’s efficiency by recommending strategies to reduce energy consumption, costs and emissions. The company’s energy experts locate incentives and create plans that will help your building conserve, save and thrive. For example, in one high-rise building, FS Energy assisted the board in conducting an LED lighting upgrade in two stages. The first phase has involved the garage, valet, loading dock and elevator lobby. So far, Phase One has saved the association $12,000 in electrical costs. During the second phase, side-defusing, high-efficiency LED lighting will be installed in all of the hallways. The association expects to recoup the costs of the Phase Two project in only 13 months, thanks to the resulting energy savings. All in all, the updated lighting effort is projected to save the association about $48,600 per year in energy costs alone. Electric vehicle charging stations are another energy saver that are becoming more common in high-rises. Tax breaks and other incentives are drawing drivers to purchase electric vehicles and ultimately, those drivers need places to recharge them. By providing charging stations, your building can boost its eco-friendly reputation and become more attractive to potential buyers, too. Survey your residents to find out if electric vehicle charging stations are something worth considering. Community shredding provides an easy, efficient way for residents to eliminate clutter while ensuring the safe, secure disposal of their confidential documents. There are options available ranging from locked receptacles for disposal of documents anytime to scheduled visits from a mobile shredding truck. With the help of a professional community management company, your board can determine the most cost-effective and eco-friendly option for your residents. Not only will you be helping to prevent consumer fraud and identity theft, you’ll be cutting down on trash by recycling paper. 3. Reduce, reuse and recycle. By 2020, California wants to see a 75 percent recycling, composting or source reduction of solid waste. The state is trying to reach this goal through a combination of approaches, including incentives, statutory and regulatory changes and recommendations. Mandatory recycling. Among the regulations that affect high-rise buildings in California are mandatory commercial recycling requirements, which apply to any multi-unit building with five or more units. As of January 2016, the state also added mandatory organic waste recycling to these regulations. What materials can residents recycle, and how they should be prepared? Is the recycling single-stream or do items have to be separated into different bins? Can bottles have lids on them? What about Styrofoam or pizza boxes? Do food containers need to be washed? Are there special instructions for organic waste? A professional community management team can assist your board or recycling committee with proper communications and compliance. Recycling electronics. Recycling electronic equipment keeps lead, mercury, and other hazardous materials out of landfills and the environment. Depending on its size, your building may be eligible for a variety of on-site service options to conveniently and safely recycle unwanted electronics including TVs, VCRs, DVRs, satellite boxes, mobile phones, MP3 players, laptops, scanners and much more. Check with your local solid waste authority, department of sanitation or public works or waste management company for more information about these services. If pick-up at your building isn’t an option, consider organizing a collection and drop-off at your local disposal site. For smaller electronics, keep in mind that area retailers may have recycling programs. For example, Home Depot collects batteries for recycling, as well as compact or linear fluorescent lamps, and Best Buy recycles small electronics such as cell phones. Recycle clothing and textiles. According to second-hand retail chain Value Village, North Americans send more than 10.5 million tons of clothing and textiles to landfills each year. Consignment, online sales and donations to thrift stores and other charities are great ways to dispose of clothing that is in good shape but no longer works for you. What about clothing that’s stained, torn or just worn beyond usefulness? Recycle it! To find a textile recycler in your area, visit the Council for Textile Recycling website. How are recycled textiles and shoes used? Pillow filling, baseball filling, paper money, home insulation, carpet padding and wiping cloths are a few of the products that can be made from recycled textiles. 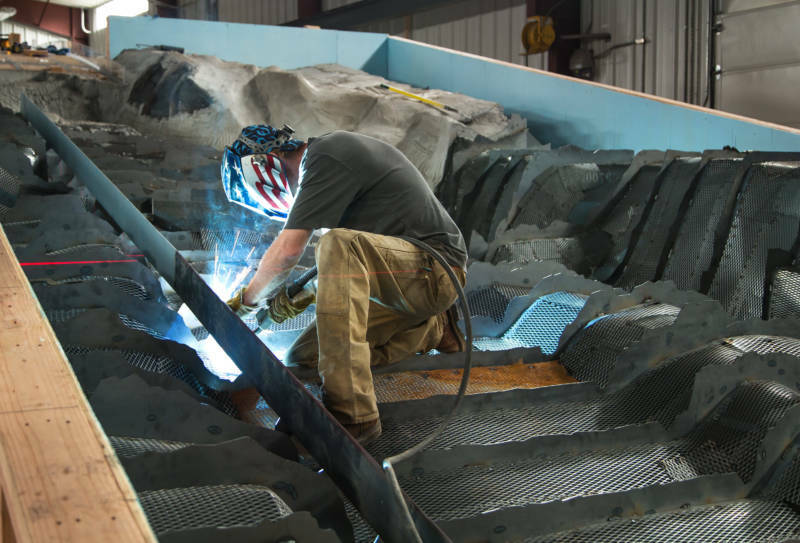 The Nike Grind program grinds up and recycles old athletic shoes into the surface material for running tracks, basketball courts and playground mats, as well as to make other Nike products. Shoes can be donated at Nike and Converse stores. 4. Have a community-wide clean-up day. Your high-rise board or sustainability committee, in collaboration with your professional community management staff, can coordinate a building-wide clean-up day. This could be seasonal, twice a year or annual. Consider combining several of the initiatives mentioned above, and invite residents to recycle various products, donate clothing, electronics, and other materials and dispose of unnecessary items from their homes or storage units during the designated event hours. With any of the programs above, clear, effective communication to residents is a critical part of the process. Policies and expectations need to be outlined, especially with regard to statutory compliance, and everyone should be reminded of these policies on a regular basis. Consider using all channels available to your residents, including social media sites, community website, newsletter, board meetings and much more. Once the committee or board decides what programs to implement, your professional community management company can help spread the word efficiently and effectively. Implementing sustainable living strategies is highly beneficial for your residents, as well as for the environment. Developing an eco-friendly community promotes longevity for your property while increasing awareness of nature-friendly habits.